Glossary of Legislative Terms: "Proxy Vote"
Proxy Vote: The practice of permitting a member to cast the vote of an absent colleague. Proxy voting is permitted only in Senate committees if committee rules allow them. Do you or your staff need assistance shaping a piece of legislation or an amendment? If yes, look no further than TheCapitol.Net’s comprehensive, one-stop course, Drafting Effective Federal Legislation and Amendments on July 29, 2009. Attendees gain a hands-on, how-to guide from faculty, starting with putting their thoughts on paper, to drafting, style, and organizational guidelines. This course is meant for professionals who have advanced negotiating, strategic thinking, and written communication skills. Participants should have familiarity with congressional documents, operations and procedures. Attendees will learn about guidelines for writing a piece of legislation, drafting styles, and approval and transmittal motions for federal agencies including the Office of Management and Budget clearance process. As part of the course, attendees participate in hands-on exercises where they dissect errors in a sample piece of legislation to draft their own legislation, while faculty give one-on-one feedback and guidance. The conference is approved for .6 CEU credits from George Mason University. Fee includes all course materials, the training edition of the Legislative Drafter’s Deskbook, a continental breakfast, and a networking lunch. To preserve the small-group, hands-on atmosphere, seating is limited. This course is an elective for TheCapitol.Net Certificate in Congressional Operations. To register, learn more, or view the complete agenda, please visit http://www.draftinglegislation.com or call TheCapitol.Net directly at 703-739-3790. Based in Alexandria, VA, TheCapitol.Net is a non-partisan firm that since 1999 has offered media, legislative, budget and advocacy training for thousands of government and business leaders each year. Are you being called to the Hill within the next few months? Does the thought of testifying in front of Members of Congress make you nervous? If so, TheCapitol.Net course, Preparing and Delivering Congressional Testimony on July 30, 2009, will prepare you with the tools you need to impress the big shots on Capitol Hill. Taught by faculty who have more than 10 years' experience working with and helping professionals prepare for testifying before congressional committees, this course eases the nerves and jitters of those being called to testify. Attendees learn all aspects of testimony preparation including research, persuasion and the effective structure of written and oral testimony. Delivery techniques to enhance oral delivery, ways to deal with stress, and techniques for addressing Q&A sessions are discussed. This course is open to all attendees who write or deliver testimony before Congress. Faculty will answer attendees’ questions about the do’s and don’ts of congressional testimony. This course is approved for .6 CEU credits from George Mason University. Fee includes all course materials, a continental breakfast, and a networking lunch. To preserve the small-group, hands-on atmosphere, seating is limited. This course is an elective for the Certificate in Communication and Advocacy. To learn more, please visit http://www.congressionaltestimony.com or call TheCapitol.Net directly at 703-739-3790. Glossary of Legislative Terms: "Engrossed Measure"
Engrossed Measure: Official copy of a measure as passed by one chamber, including the text as amended by floor action. Measure is certified by the clerk of the House or the secretary of the Senate. Glossary of Legislative Terms: "Cordon Rule"
Cordon Rule: Senate rule that requires a committee report to show changes the reported measure would make in current law. The Lobbyist Registration and Compliance Handbook is an easy-to-use manual that compiles information, forms, guides, rules and regulations governing federal lobbying, including an overview of HLOGA. 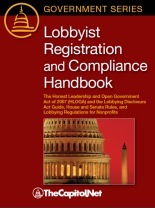 The Handbook has 23 chapters and includes Lobbying Disclosure Act Guidance; user guides for the official Lobbying Disclosure Electronic Filing System; congressional rules for and examples of allowed and prohibited gifts, gift exceptions, travel, and conflicts of interest; gift-giving under executive branch regulations; the restrictions on lobbying after leaving the House or the executive branch; observations on lobbyists' compliance with the disclosure requirements; and a guide for lobbying by non-profits.